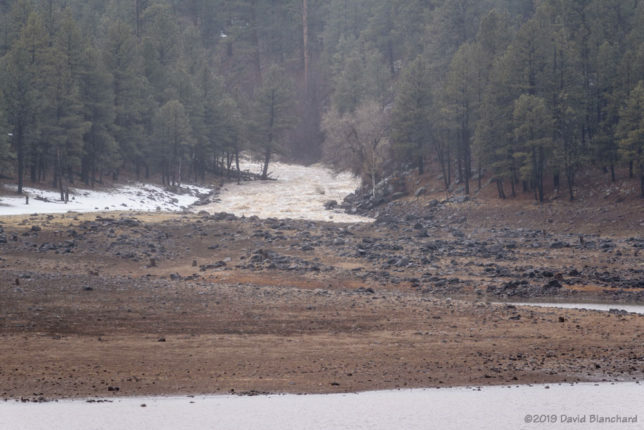 Over the weekend we had an extended period of rain in the Flagstaff area. Normally we would see snow at this time of year.—it is, after all, the middle of winter. 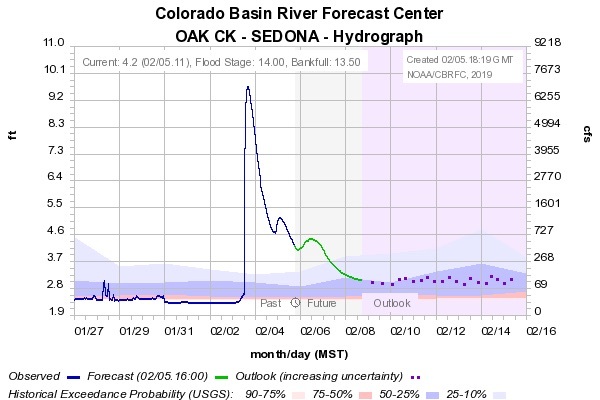 Rainfall amounts were sufficient (1.35 inches at Flagstaff airport) to cause large increases in the flow of Oak Creek where gauges recorded a rise from ~2.4 feet (30 cfs) to 9.6 feet (6900 cfs). Other streams were running high as well. 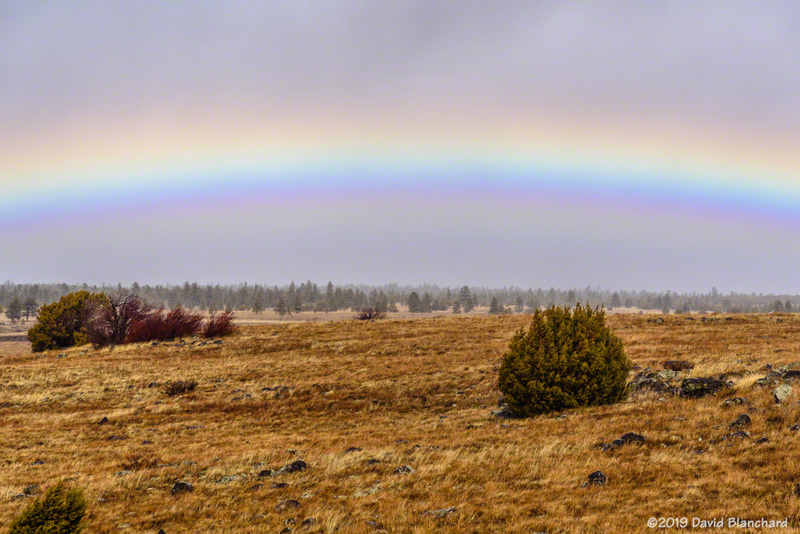 A winter rainbow in Flagstaff. I though it might be interesting to look at Lake Mary and Mormon Lake to see if lake levels were increasing as a result of the runoff. Indeed, they were, but not quite as much as I had hoped. Still, water rushing down Newman Canyon, a normally dry wash, into Upper Lake Mary was impressive. Newman Canyon, a normally dry wash, is filled with runoff pouring into Upper Lake Mary. Back in December 2004, we had a much bigger rain event. Lake Mary was frozen and the water rushing down the hillsides flowed across the top of the ice. The immense weight of the water caused the ice to break with thunderous booms. That is what I was hoping to experience. Didn’t happen because there was no ice this time. Stream gauge for Oak Creek showing the rapid rise in stream flow. My next stop was Mormon Lake. As I drove towards it the sun was able to break through the thinning clouds to my south. 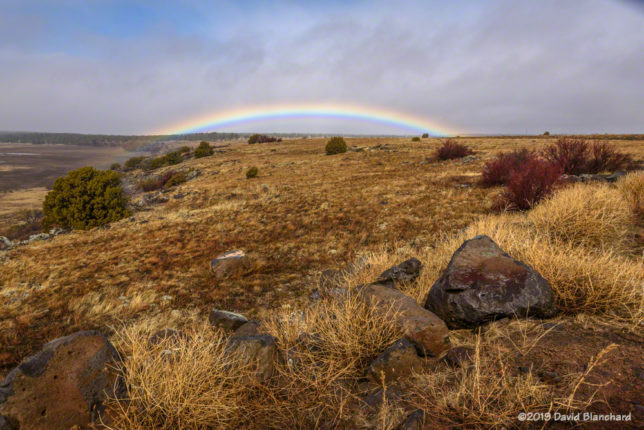 I took a quick look in the rear-view mirror to check for rainbows. And, there it was. A winter rainbow in Flagstaff. Not rare, but certainly not common.